According to this meme, a chinese farmer spent 16 years preparing for and ultimately winning a lawsuit against local energy company Qigua Group. Now I've been digging around a bit and found several references to this story. But all of them refer back to the original post on People's Daily Online. Problem is, it's in Chinese and I cannot easily vet it as a source. To be clear, I do not really consider any of the above sources reliable in this matter. The farmer wasn't a one-man crusade. The farmer didn't spend 16 years preparing to sue the chemical company. The farmer didn't need to rely on his own legal expertise since he had a lawyer. The factual background about a farmer working toward a legal victory over a chemical company appears to be true, as supported by the references below. Some of the dramatic details like if the farmer bartered with the local bookstore using corn are harder to verify, though they do seem plausible. A Chinese farmer who quit school in 3rd grade spent 16 years teaching himself law to sue a chemical company for polluting his village. This sounds like he spent 16 years teaching himself law before filing the lawsuit. Rather, the pollution event happened in 2001 while the case was won in 2017; that's 16 years from start-to-finish, leaving no window for him to have spent 16 years studying to sue the company. Also, it seems weird for the meme to talk about the farmer studying law as though he were acting as his own lawyer, which doesn't appear to have been the case. He won the case in 2017. The claim that he won the case makes it sound like he alone fought and won the battle. Since he was hardly alone, this wording's at least misleading. The best reference that I've found is "China chemical safety case study: Qihua PVC plant in Qiqihar, Heilongjiang Province" (PDF) (2015-01), predating the cited news article by a bit more than two years. The source of this case study is IPEN. Wang Enlin began work to protect his rights in 2006 and received assistance from the Center for Legal Assistance to Pollution Victims (CLAPV) in 2007. “Contaminating 28.57 hectares of land, including farmland and grassland, at one time is actually a crime,” said Professor Wang Canfa, an environmental law expert at China University of Political Science and Law (CUPL) in an interview with the Legal Daily back in 2008.20 Associate Professor Xu Kezhu, another environmental law expert at CUPL, believes that the QCG has violated Articles 45 and 63 of China’s land administration law as well as the provisions concerning the crime of illegally occupying agricultural land in Article 342 of China’s criminal law, as it leased the land and has contaminated it by storing industrial waste there for a long period of time. Wang Enlin and his lawyer visited the local environmental protection, agricultural and land administration bureaus (as well as law enforcement authorities) only to see inaction of the administrative authorities and the local court’s unwillingness to hear this case. However, instead of giving up, Wang Enlin collected key evidence such as copies of the land agreement and the overall plan for land use over the past years. Apparently a documentary film crew helped to increase their visibility. Note that the film crew, Green Beagle, is listed as a co-author of this case study, so there may be bias. Green Beagle staff members invited documentary filmmaker Wang Jiuliang to visit Qiqihar in early July 2014, where interviews took place with Wang Enlin, Wang Baoqin, Li Diankui, Yang Zhenqing and other active participants in the pollution issue. They film crews gathered information and filmed other pollution victims in the village. In addition, they collected four sediment samples (one surface water sample and two groundwater samples) for testing, further determining the main pollutants as evidence in the upcoming civil damages trial. Wore the bleak autumn wind, Qiqihar City Angangxi District elm village village Wang Enlin and Wang Baoqin early in the morning arrived at the Angangxi District Court. Since this article is from about 8.5 years ago and it sounds like Wang Enlin was heavily involved in the legal process at this point, it seems plausible that he was invested in this battle since the initial pollution event that the article alleges happened in 2001, giving plausibility to the 16-year figure. Given these sources, it appears that this claim is based on a true story. Wang Enlin couldn't afford to buy all the law books he studied at a local bookstore, so he paid the store in bags of corn to let him sit and read, copied all of the information by hand, and learned what he could with the help of a dictionary. 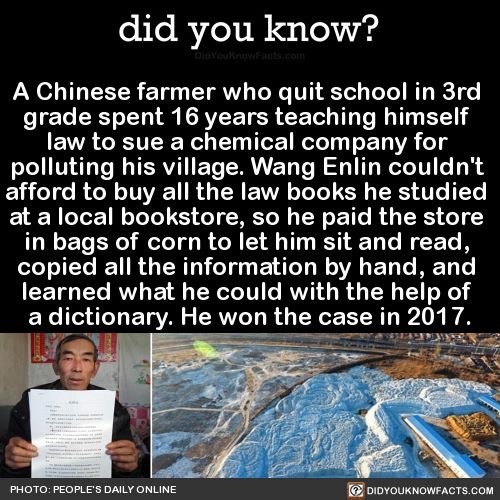 As a rural Chinese farmer, it seems pretty likely that Enlin was poor and uneducated, so it's entirely plausible that he couldn't have easily afforded a library of legal textbooks. Doubly so if the local agricultural industry took a hit from the land being contaminated, as alleged by the law suit. And since both of the above references mention the locals growing corn, it seems plausible that a local farmer would've had access to corn to barter with. So that part's also quite reasonable. But, did he actually barter with the corn that he probably had access to for the ability to read legal texts at a local bookstore? That's harder to verify. Also, I didn't find anything about whether or not he quit school in the 3rd grade. This seems plausible, but not verified. The claim that "[h]e won the case in 2017" is arguably true in the sense that it seems like Wang Enlin was heavily involved in pursuing a court case that was apparently won (haven't found official verification of the court's decision). However, the wording seems at least misleading in that Wang Enlin wasn't the only one behind this. As noted by the above references, others were involved in this law suit, including some government officials, academics, other farmers, reporters, and the documentary crew; possibly others too. Not the answer you're looking for? Browse other questions tagged china internet .